Us vs Them.. How Did We Get Here; How Do We Get Out?? I haven’t thoroughly thought out a particular strategy for my contribution but being a history buff I know we need to find where we have been before we can figure out where we are going. So, I will start out here with studying the biggest examples and then search for a possible solution. Going from there will likely be how each of us can contribute to putting the current “Us vs Them” episode into the past. I know this is a noble goal, especially at this late stage of my life but I want to be one of those millions who contribute, so why not. To finish this first post I want to talk a little about the featured photo of this post which is also included in the banner that will be on each post on this subject. 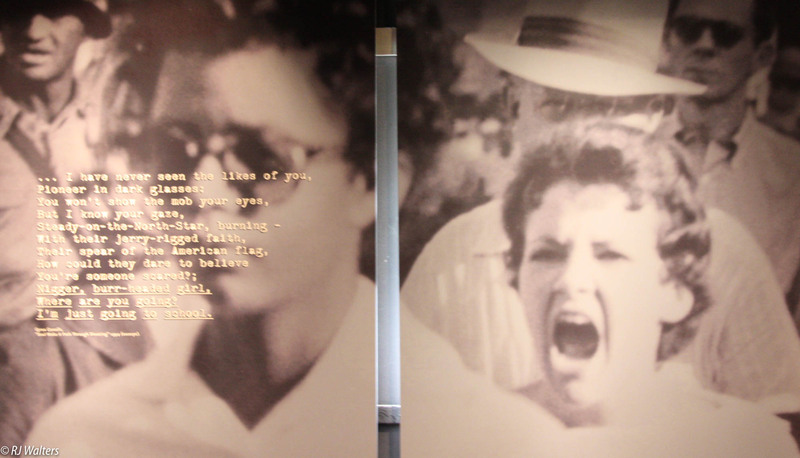 It was a large illuminated panel shown here which is at the “Brown vs Board of Education” national site in Topeka Kansas. The building is not a large one but contains many artifacts that will make you think about racial prejudice and particularly the Civil Rights era. Many of you probably recognize the picture as Birmingham Alabama forced school integration. On September 10th, in 1963, twenty black students entered previously all-white public schools in Birmingham they were protected by National Guard soldiers. As I was going through the rooms I suddenly came upon on this large picture and the hate that filled the young white woman’s eyes literally shook me to my bones. I have never seen hate personified as I did in the large photo. Every time I see the photo I wonder if that young girl ever got over the hatred she had? If she didn’t it probably consumed her as it did so many southern bigots of those time. Now a story about my personal experiences with racial prejudice in the Southern States in the 1960s and 70s. I was a young engineer in 1972 when I was sent to a Shreveport Louisana factory to assist in solving a manufacturing problem. It was there that I met Mel. He was a “good ole boy” that all the engineers loved to hear his stories. When we went to the cafeteria for a coffee break he proceeded to tell his dehumanizing story about lazy black niggers. I was totally embarrassed by his words and even more embarrassing was that the told in within hearing distance of scores of African-Americans sitting in the dining room. That fact didn’t bother him at all, in fact, it probably excited him. This was my first real exposure to racial prejudice and it stuck with me throughout my life. I think throughout this series we will come to find that turning your enemy into something inhuman is an essential part of this ugly process. I don’t think it’s gonna get any better any time soon. It’s disgraceful the racism that’s come out of the closet since Trump got elected. And the blame is on many of his supporters who have always held these views. I don’t think it will change for another few generations if we survive that long. I also I found out racism is alive and well in the North and West as well is the South. The link below is not hopeful either. Mary, this is one where I have to disagree with you. I just don’t see these times as a new norm lasting for years to come. I have been collecting quite a few of these stories for my “How did we get here” series and found that it doesn’t take much to finally overcome the hate and extreme rhetoric. For instance, the McCarthyism years lasted from 1950 to 1954. It just took one sentence (“Have you no shame”) to cause its collapse. No, it won’t happen overnight but it will happen but it won’t take generations. In today’s world, nothing happens that slowly anymore. 🙂 Maybe I am just a “glass half full” person but I still think that the majority of us are decent and compassionate individuals who, give the right stimulus, will overthrow this era like we have the past ones.